So what exactly is a "Command Center"? It's really just a fancy word for an area in your home that houses all of the important information to keep your family running on course. Some homes require large stations while others maintain on small spaces. It really just depends on the size of your family and the amount of activities in which you are involved in. One of the largest means of paper clutter comes from mail. We typically have our hands full when we bring in the mail and throw it down on the first surface that we see. I like to use a receptacle that has multiple slots so I can go ahead and sort the mail by bills, sales fliers, and miscellaneous. Multiple galvanized tins hung on the wall with a chalkboard paint label allows you to step outside of the box! When my family is running out of the door, we are typically literally running! It does not matter how organized I am, if I have not placed all of the belongings that need to go with us into my "car" bin, it will most likely be left behind. You can simply use a small plastic bin with a lid to keep it from spilling out while driving. This little cutie that I use is from the company thirty-one. You come into the house with your hands full of junk mail- what do you do? Easy! Throw it into the recycle bin! (And shred any junk mail that may have your personal information on it.) Buy typical trash bins and add your own labels to save money! This momma got clever and just assigned everyone a number. A sitting area is not a necessity but it is a major convenience when your little ones are trying to get shoes on and off or just to place items when getting situated. I have a simple antique bench at my command center but a chair will work just fine too! Kids need a place to hang their coats and backpacks, moms need a place for her keys and purse. Click on the image below to see this darling DIY shelf and hook system from Martha Stewart. Need to give a call out? A board that will allow you to write your own message is very handy in a command center. A simple chalk board or dry erase board would be perfect for this! Sometimes you need to pin up important papers so that they are right in your face. Hang up a cork board, clip boards, clips on a twine, metal board with magnets. This is a also a good place to get creative and make your command center beautiful! I love these vintage trays with magnets! So unexpected! Are you in total overload yet? As you can see, a command center is just basically a spot in your home that helps your home run smoother. 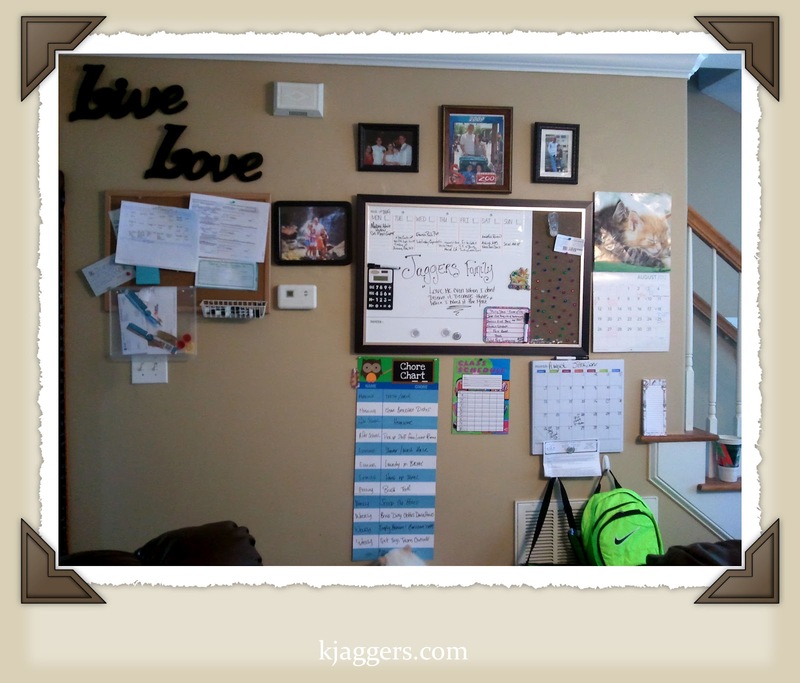 Common places for command centers are in the mud room, entryway, coat closet, kitchen, anywhere that you can find a spot, you can create a command center. If you have an extra kitchen cabinet, you can create a command center in a cabinet. While I'm sure that this command center is very functional, it is distracting to the wall. Notice how the balanced command center becomes a piece of art on the wall. It is because it is balanced and each item compliments each other. Keep that in mind when choosing your items for your own command center. Creating your own command center! This should certainly help to keep your family organized year round!!! Keep an eye out for Back to school organizing part 3: Preparing your kitchen.